I love photographing weddings in Sheffield, just up the road from the city is Chesterfield and in the middle is the beautiful boutique Casa Hotel, its lovely modern and sparkly inside. Perfect for a spring wedding. Kate looked amazing in her beautiful lace gown and there was lots of excited bridesmaids getting ready in her room. Meanwhile downstairs the groomsmen were waiting nervously in the bar! I think Lee was pretty blown away when he saw Kate walking down the aisle – maybe a little tear! After the ceremony the guests were treated to a magician and drinks while we headed outdoors for a few photographs. The bridal suite made a good view for a full group photo too! The ceremony room was dressed with twinkling lights and after the meal there were some funny and emotional speeches. In the evening we took a few more photographs in the stunning interior of the hotel and outside in front of the lights before heading indoors for cake and dancing! We wish you both much love and luck for the future – thanks for making us feel so welcome and it was a pleasure to see our previous bride and groom there too! 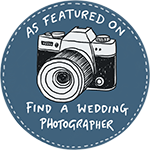 Helen & Paul have had 10 years experience photographing weddings in Sheffield. They are now based in the lovely Lake District and now photograph weddings all over Cumbria and also still Sheffield, Yorkshire and the Peak District. Contact us to see if we have your date free!